At the Louisville contest on July 21, DCI hosted a clinic/workshop for newer judges and prospective judges from the Midwest region. Coordinated by Dallas Niermeyer and directed by Marie Czapinski and Gary Markham, with instructional help from caption heads Glenn Fugett and Andy Poor, 14 judges spent Saturday morning in intensive instructional meetings.^In the afternoon the trainees visited several corps rehearsal sites where they were permitted to get on the field and adjudicate the final run through rehearsals. 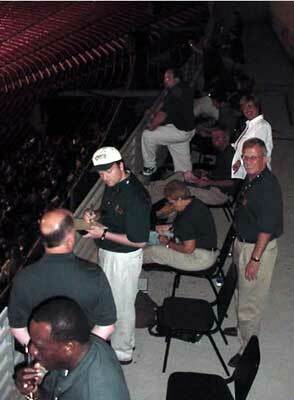 This breakthrough concept in judge training was facilitated with support and cooperation of the Colts, Madison, Cavaliers, Carolina Crown and Glassmen.^All 14 trainees spent the evening at the contest, judging the 13 corps from the vantage point of the press box in the beautiful Papa John's Cardinal Stadium. At the close of the contest they were able to observe the critique and study the techniques the working judges used to discuss clarify ideas with the instructional staffs.